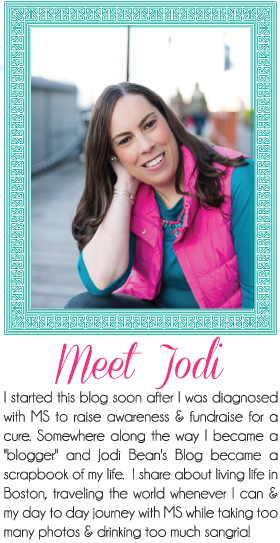 Jodi Bean's Blog: Counting Down. . . I don't know about you but if I don't have some fun stuff to look forward to then this time of year gets pretty tough. I'm sick of the cold and the snow. It is grey and dark. I need to hold onto the fact that spring is just weeks away and with that comes many GREAT things. Here is what I'm counting down to. . .
17 Days until my Fundraiser For MS. Will you be there? March 23rd from 5:30 to 8:30 PM. Let me know if you would like to come and I'll give you the location and other details. I've gathered up a few excellent raffle items! 29 Days until Red Sox Opening Day! I still can't believe that I'm actually going to Opening Day and not just any Opening Day but one where the team will be presented with their World Series rings. I'm so excited and I can't wait! 31 Days until the Boston MS Walk. This will be The Bean Team's sixth year walking at the Boston walk and we are excited for another great year. All our welcome so if you would like to join us let me know. I'm working on our team shirts and have a couple of cute ideas. 63 Days until my ITALIAN HOLIDAY! I still can't believe I'm going to Italy for vacation. Stacy and I have been talking about this trip for years and it is finally happening. We are going to have such an amazing time and I can't wait to spend time with her. We will have plenty of time to catch up over many bottles glasses of wine! 92 Days until Michigan weekend/Visit my grandfather/D-Day Anniversary/Red Sox game! That is a lot of fun stuff jammed into a weekend. My mom and I are going to MI to visit my 90 year old grandfather. We will celebrate and honor him on the D-Day Anniversary. It also just so happens that the Red Sox are in town that weekend so it was meant to be. I can't wait. It has been way too long since I last saw my grandfather. 183 Days until the MS Challenge Walk aka 3 day 50 mile walk! I am so happy that The Bean Team has tripled in size. We are going to have so much fun. I've already started fundraising and plan to start "training" in April. It's hard to believe the snow will melt in time for all these things. The weather is still so cold! Horrible. I am so jealous of your Italian vacation! Can't wait to see your pictures. I am so looking forward to spring, if it ever arrives! so many things to look forward too! that's exciting that you have those walks to do - i need to do something like that! I'll need to start training with you! When we went to DC in 2009, we ate at this incredible restaurant named Equinox...highly recommend! I'm looking forward to your fundraiser! So much awesome stuff coming up for you. Sweet score on opening day tickets! Awesome events coming your way! So many things to look forward to. I can't believe you are going to Italy either. What an amazing vacation. It is on my bucket list so take lots of pics so I can live vicariously!! I love this post! I also love having fun stuff on the calendar! I've been going to Mariners opening day every year for the last 14 years, but it's nowhere near as exciting as being World Series Champs! That's going to be a blast!